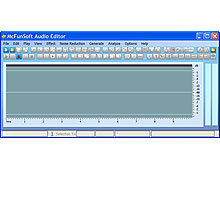 McFunSoft Audio Editor 7.4.0.12 - Download Win Apps. Edit, record, convert - mp3, rm, wav, wma, etc. Analysis audios in waveform.. It integrates all of the most-used audio editing technologies into one.It’s the only authoring editor that gives you efficient access to editing, recording and converting. Every most-used audio formats are defined, including: WAV, PCM, MP3, WMA, OGG and others. Advanced visual data analysis options such as Frequency Analysis, Waveform, Spectral View are at your disposal. A truck of effects and filters will satisfy a most refined musicians taste.